The Mayor’s Task Force on Safe Art Space is working to create a citywide network of safe, cost effective, contemporary, living, live/work, studio, and performance spaces for emerging and established artists. They need your input! Fill out the Safe Space Survey here. The Task Force integrates the perspectives of artistic, design, development, financial, regulatory, and revitalization exports to develop strategies, identity resources, and propose a programmatic framework that will develop and sustain spaces that protect the safety of artists and patrons, while meeting the logistical and technical interests of today’s performers and audiences. Click here to find out about upcoming task force meetings. Maryland State Arts Council is the largest funder of operating support in Baltimore City and is critical throughout the state and region. Our chance to advocate for local arts funding is now! Register for Maryland Arts Day on February 14 to show your commitment to the arts in Baltimore City. Early bird registration is through Friday, February 3rd. Click here to learn more and register. Americans for the Arts’ Advocacy Day is March 20-21. Both the National Endowment for the Arts and the National Endowment for the Humanities are threatened in the country’s current political climate. Click here to learn more and participate. Click here to learn more from Americans for the Arts about about the funding threat to the NEA. Join the Arts Action Fund (for free) so we can get alerts to you as quickly as possible and you can respond to decision-makers fast. Since the tragic Ghost Ship artist warehouse fire in Oakland on December 2nd, artist live-work spaces have been subject to increased fire safety scrutiny nationwide. Locally, on December 5 the Bell Foundry live and work artist space was inspected and condemned. Residents and cultural workers were evicted without advance warning due to code violations. 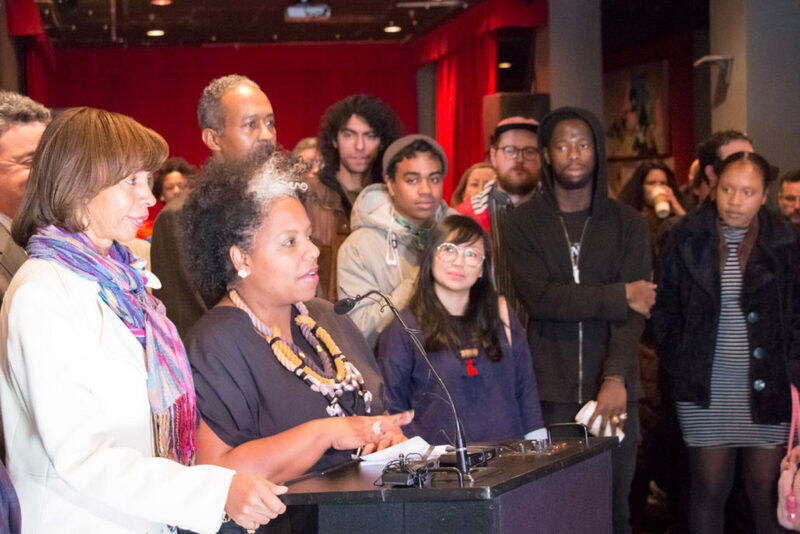 Today, December 21, Mayor Catherine Pugh announced a Task Force on Safe Art Spaces comprised of artists, city officials, cultural leaders, and developers. Citizen Artist Baltimore will work with the Mayor’s Task Force to contribute to housing solutions benefiting artists, cultural workers, and all Baltimoreans. Station North Director Elissa Blout Moorehead speaking alongside Baltimore Mayor Catherine Pugh at the press conference announcing Task Force on Safe Artist Spaces. Low-income artists seeking affordable live/work spaces routinely take on the financial and bodily risks of converting and occupying former industrial and commercial spaces. These spaces serve not only as places of artistic production and affordable shelter, but also as community spaces for marginalized groups, including those identifying as queer and people of color. The loss of these safe spaces is one piece of a much larger set of housing challenges in our city. Low income families are increasingly unable to find fair and affordable housing throughout Baltimore. More needs to be done to ensure access to safe and affordable housing and workspace for all. As fire marshals continue to inspect buildings, Baltimore City should commit to supporting the immediate needs of those living with housing insecurity who are seeking to make necessary improvements and to also invest in other long-term solutions. Citizen Artist Baltimore stands in solidarity with long term fair housing advocates represented by the Baltimore Housing Roundtable and Housing For All, and support their efforts to implement the Affordable Housing Trust Fund approved by voters in the general election. Safe and affordable housing and workspace is a human right. Citizen Artist Baltimore values the rights of artists, and all Baltimore residents, to safe and affordable housing and workspace. We will work with City Hall to make sure artist voices are heard! Sign up for action alerts as the new Mayor and City Council address these issues and to learn about other opportunities to advocate for arts and culture. Click here to use the form on our frontpage to sign up for action alerts!